Seven cats on my desk. Okay, there were the five yesterday, and today I had the opportunity to get all seven, which is the typical morning arrangement. They’re not as nicely grouped, but that’s partly because I had to stand up to take the photo, which caused Mimi and Jelly Bean to also get up and get ready to accompany me wherever I was going. 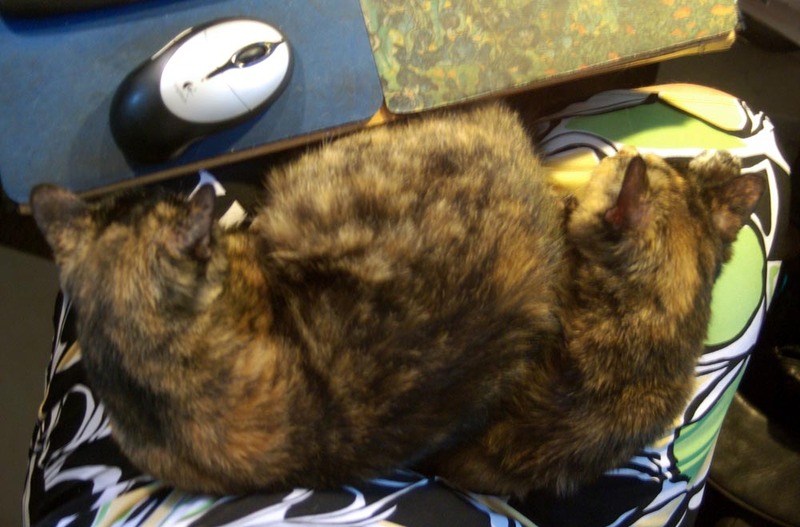 Two torties on my lap. Cookie had been trying to get back on my lap, but I’d never be able to get up then. She and Kelly had been on my lap, and I was trying to keep them both on the keyboard shelf so that I could quickly stand up and take the photo. From the back this time are Mimi and Kelly on the shelf; on the desk are Jelly Bean, Mr. Sunshine, and Mewsette and Giuseppe cuddled in a heart shape. Cookie is on my keyboard shelf, getting ready to jump down to my chair since it’s nice and warm after me sitting in it. I think the heart shape cuddling is usually Mewsette’s idea. In every photo I have of two of them cuddling in a heart shape, Mewsette is one of the kitties! Nonetheless, this is what my mornings are like. I gave up keeping my desk neat because anything that is set on it is moved around for kitty comfort. I’m actually looking for a new desk, shelves and whole workspace in this little corner with lots of cubbyholes to tuck things out of kitty reach, so I’m not too concerned at the moment. As I said about yesterday’s photo (from 2011) (and don’t miss the update from just yesterday, 2012! ), I’m sure they all like me and enjoy spending time with me but I know their dedication to my desk has to do with the “kitty keep-warm lamps”. During the summer I don’t use the task lights very often because the room is generally bright enough, and the lights are just too darned hot. As the air cools and the sun drops down lower in the sky, my office is suddenly darker with all the trees outside. From then I turn the lights on, and if I ever needed a passive cat-herding apparatus it would be these lights. I have actually set up lights elsewhere just to see what happens, and they are immediately popular. It’s a very, very sweet memory as we approach Pet Memorial Sunday and I prepare my speech about “The Joy of Pets”, loving again after loss.